Deep inside the Narayana Hrudayalaya heart hospital, in the city of Bangalore in southern India, an extraordinary scene is taking place. The hospital's director, Dr Devi Shetty, is not in the operating theatre. Instead he's sitting in a chair with a remote control "zapper", talking at what looks like a simple television set. In fact it's a satellite video link to a hospital thousands of miles away in Calcutta. Onto the screen comes a steady procession of heart patients and their carers. One by one, they speak to Dr Shetty across the satellite and are given a businesslike diagnosis or follow-up advice. Next to Dr Shetty, his colleague Dr M Natesh sits with another screen showing angiograms, X-rays and other information already gathered on the patients. Dr Shetty is therefore armed with all the data he needs to make a speedy diagnosis. Some are new patients, some have been in many times for this free service. To the worried parents of a sick child, Dr Shetty promises money to bring them to Bangalore for an operation. To another, advice: avoid butter and ghee. A local Calcutta doctor, Swagath Chowdhuri, is on hand to help the patients - some of whom are poor or illiterate - and to say what medicines are already being given. And one by one, the patients get up, reassured; one is even handed Dr Shetty's visiting card as he walks away. 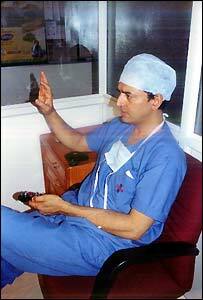 A busy heart surgeon, Dr Shetty takes time every day to come down to this "telemedicine" unit. Telemedicine began here two years ago, with the realisation that most of India's specialist doctors live in a small number of large cities - but also, that most of the time, diseases do not actually require surgery. The Indian Space Research Organisation, based here in Bangalore, stepped in to help with funding. This hospital now has 13 satellite video links with distant hospitals within India, plus terrestrial video links including ISDN (integrated services digital network) with places including Malaysia and Mauritius. Links are about to be set up with Tanzania, Bangladesh and even Pakistan. I asked Dr Shetty whether it was disconcerting not to be able to touch the patient. "These people are 3,000 miles away, and this is the best they can have," is his reply. "Technically speaking, in terms of disease treatment, the doctor has to touch the patient only when he has to operate. "And if I don't need to operate, I don't need to touch the patient. If I don't need to touch the patient, I don't need to be there. I can be anywhere." Emotions and feelings can be conveyed freely across the satellite, he adds. Over the satellite link, I spoke to Moshumi Banerjee in Calcutta. She and her brother are anxious about their elderly father, who has had a recent scare after an earlier heart attack. 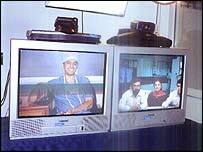 They have already attended the telemedical consultation several times. "We think it's fantastic," she told me. "Having spoken to Dr Shetty this morning for those few minutes, I already feel half-consoled. "Over here in this part of the country, we all believe Dr Shetty is next to God." The Narayana Hrudayalaya renounces the linking of medical treatment with money. Where it can provide treatment for free, and where the need is greatest, it does so. It has recently provided life-saving operations for a number of children from Pakistan, including Noor Fatima, who made news headlines because she travelled to India on the newly re-established Friendship Bus. Dr Shetty and his colleagues want to see telemedicine spreading, with link-ups possible in even the smallest district headquarter towns. But the links are now spreading beyond hospitals. 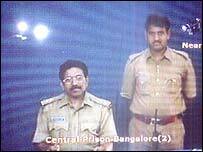 I visited Bangalore's central prison. This is a highly unusual jail: it already has a video link-up with the law courts so the inmates' cases and appeals can be heard without them being transferred. Now it has just established a link with the Narayana hospital to benefit some of the many prisoners with medical problems. Anand Sampath, technical coordinator for the hospital's telemedicine programmes, explained the logic. "We thought, why couldn't we capitalise on the situation? They already have a wonderful set-up there with ISDN connections and state-of-the-art connectivity. So we thought it could cater to the emergency services within the prison as well." The link-up will involve diagnosis through an eco-cardiogram image, sent direct to the hospital. The chief jailer, C Prabhakar Murthy, told me that many patients from inside the prison's hospital stand to benefit. "There are more than 180 in-patients in our hospital," he said. "They are suffering from different diseases. If any problem or emergency occurs, they will immediately be brought here to take advice from the Narayana Hrudayalaya. "Then the doctors will give directions for them." It's hoped that from this start in Bangalore, telemedicine will grow and grow - a spectacular way of overcoming distance and time in tackling severe medical problems.